Continuing the series, here we have comparisons of another great classic: Defender & Defender 2/Stargate. However he missed out the Atari ST version!!! I've always been very impressed with the 2600 version of Stargate/Defender II. I think it is the best arcade port for the system. There's also Defender 2000 for the Jaguar that he didn't include but I suppose, since it is an update and not a direct port of the arcade, that is ok.
Defender was probably my favorite 2600 game and Defender 2000 and Protector SE are two of my favorite Jag games. Very easy games to pick up and play but very tough to master! So you are not among those who felt that Atari port of Defender was poorly made? No but to be honest I was really young and I don't think I had ever played it in the arcade before so I had nothing to compare it to. As for 2000 I know a lot of people don't really like it and I will admit that Protector is a lot closer to classic Defender then 2000 is but that doesn't make it bad, just a little different. I don't think Defender 2000 is bad at all. But I will admit that I do prefer to play Protector SE. The size of the ship on Defender 2000 makes it a bit harder to play. For me Protector: SE is one of the best games on the Jaguar. 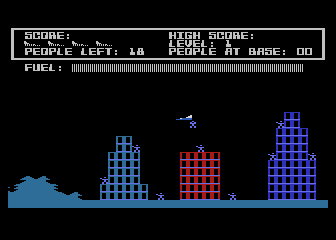 Defender 2000 is actually best played in the "PLUS" mode I think, far easier to see what is going on. You might have noticed that the Atari ST version of Defender/Defender 2/Stargate was also programmed by Jeff Minter back in the early days of the ST. His work for Atari on that was what led to him getting hired to do Jaguar coding. Getting a little off topic here but anyway what is the story behind Protector? Where does Bethesda fit in and how did Carl end up getting it? The original protector by Synapse Software was a game for the Atari 8-bit and the Commodore VIC-20. It came out way back in 1981. The Jaguar version was programmed as a brand new follow up to those games and was offered to Atari for publication but they turned it down because they were already developing the very similar Defender 2000, much to the coders disappointment. Synapse Software were taken over by Bethesda Softworks and so when Carl discovered the games existence he licensed the game from them and finished it off himself.